All Department of Children and Families front-line staff who investigate abuse and neglect of children and vulnerable adults have new identification badges and shirts as of March 2012. These credentials identify the employee as an investigator with our agency and include the person’s photo. 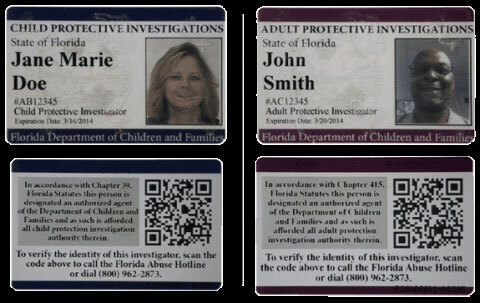 Hologram images of the DCF logo and the state of Florida covering the front of the card prevents duplication. Child protective investigators will have one standard badge with a solid blue outline, while adult protective investigators will carry a similar badge with a purple outline. You can verify the identity of an investigator 24 hours a day, seven days a week by contacting the state Hotline at 1-800-962-2873. This number is provided on the back of the identification badge. To connect to the Hotline even faster, you can use your smartphone to scan the QR code on the back of the badge, which will prompt your phone to call the Hotline directly. 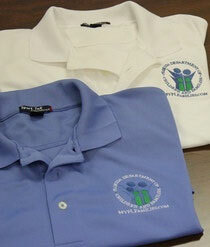 The new shirts worn by investigators are shown in the picture and have the new DCF logo on them.